Our trademarked formula uses proven ingredients found in nature and is built with the highest recommended dosage to give you the fastest, safest, and most effective results possible. This product is made with naturally sourced ingredients each possessing incredible metabolism boosting and fat busting effects. Our ProC3G formula includes C3G, the most clinically studied anthocyanin molecule, proven to reverse fatty acid storage as well as negative effects of high fat or poor diets. 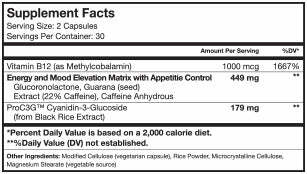 Take 2 capsules upon waking before first meal or before exercise. An additional serving of 2 capsules may be taken 4 hours later before a meal or exercise session to support intense training needs and metabolic goals. The B Vitamin family is widely recognized as playing a key role in energy production and metabolism. Vitamin B-12 in specific, is linked to energy because of its role in metabolism, red blood cell development, and DNA formation. About 40 percent of Americans aren't getting enough of this important nutrient in their daily diet. 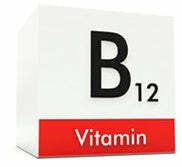 It is really next to impossible to get "too-much" Vitamin B12, since it is a water-soluble vitamin. This means that our bodies can eliminate any excess amount we consume. Guarana extract comes from a plant native to the Amazon rain forest, commonly found in Brazil. It is a natural source of energy for our minds and bodies. Guarana is also a potent thermo genic, assisting in burning extra calories while dieting. This amazing ingredient is sourced from naturally grown Black Rice. C3G is a member of the anthocyanin family, a class of natural molecules that have profound effects as anti-oxidants. The effects of anthocyanins support both weight loss and overall health. C3G is proven to be the most effective anthocyanin, having been clinically proven to demonstrate remarkable effects in reducing/slowing down fatty acid storage at the cellular level. This means that you can lose weight faster and more safely than ever before. HPN Nutraceuticals takes safety very seriously, which is why we independently test every batch of all our performance products for label claim, heavy metals, banned substances, and adulterants with the BSCG Organization. M(6) is based on a natural ingredient profile, with its key ingredient coming from a specialized black rice extract. 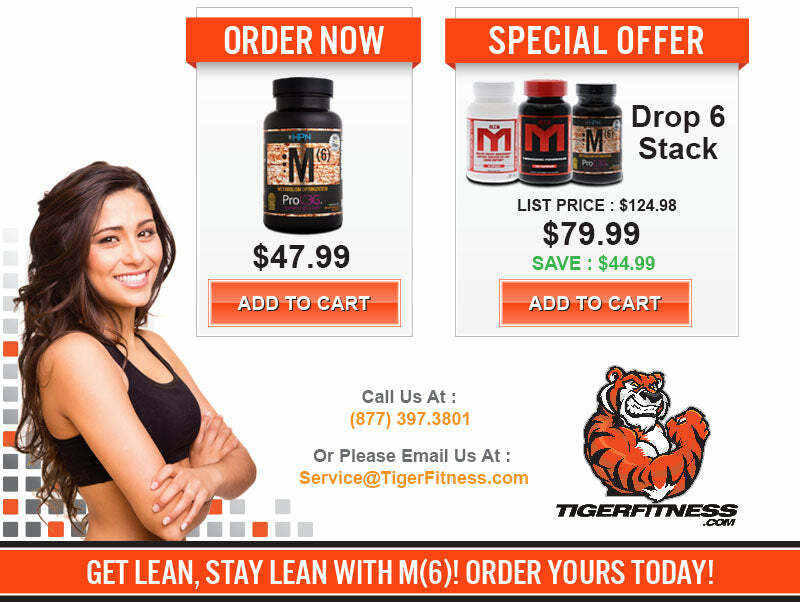 Due to its low stimulant profile, M(6) is suitable for a large percentage of healthy adults. However, anyone with high blood pressure or under a doctors care for other medical issues should consult their doctor prior to using M(6) or any supplement. WILL M(6) MAKE ME JITTERY OR CAUSE ANXIETY? Due to its low stimulant profile, M(6) is not likely to cause jittery or anxious feelings. Those who are more sensitive to caffeine or other stimulants may start with 1 capsule per serving to assess their tolerance and increase to a full 2 capsule serving from there. M(6) works through a novel mechanism where in the product reduces fatty acid storage at the cellular level. In combination with a controlled calorie intake and consistent workout regimen, this will cause an increase in the rate of fat loss, while eating the most calories possible. WHAT IS THE BEST TIME TO TAKE M(6)? The best time to take M(6) is with your pre-workout meal or immediately upon waking before breakfast. 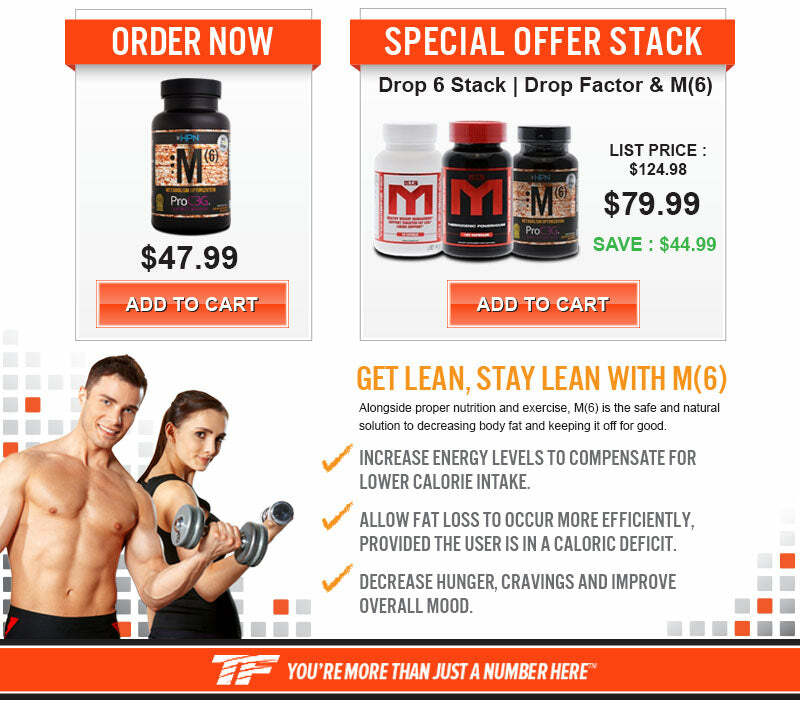 HOW SHOULD I EAT TO GET THE BEST RESULTS FROM M(6)? We recommend a consistent calorie level set at a small deficit with adequate lean protein intake to maximize fat-loss while minimizing muscle loss. Rating : 5/5 - 27 Reviews.